England - London - LIFFE futures traders. 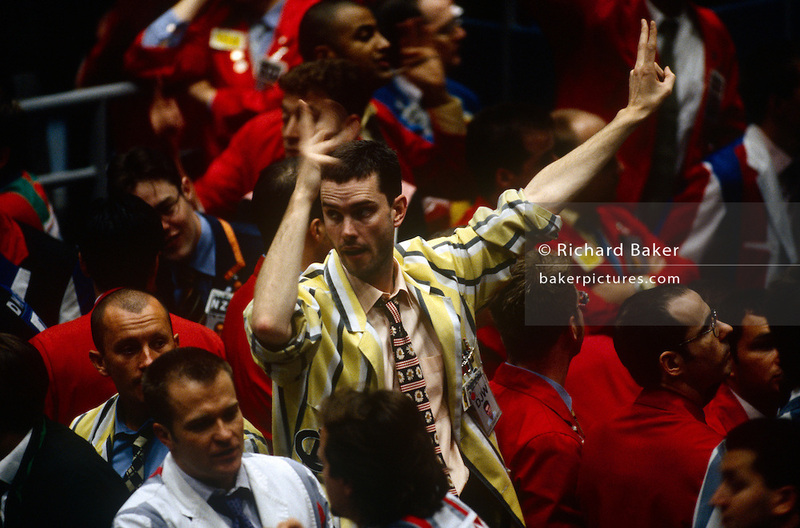 Brokers using the 'open cry' form of communicating futures and commodity prices on the trading floor at the London International Financial Futures Exchange (LIFFE) in the 1990s. The floor is also known as the bear pit where derivatives, options, futures and their contracts are exchanged in a frenzy of arm and hand expressions which communicate prices and quantities. The LIFFE exchange was synonymous with the Thatcherite capitalist money-making ethos in the City of London of the 80s and early 90s before the takeover by Euronext in January 2002. It is currently known as Euronext.liffe. Euronext subsequently merged with New York Stock Exchange in April 2007. © RICHARD BAKER. ALL RIGHTS RESERVED. NO COPYING, SCREEN GRABBING, WATERMARK REMOVAL, TRANSMISSION AND NO PUBLICATION WITHOUT PERMISSION FROM THE AUTHOR.